Adam took over from here whilst Olly sorted out the data. A quick refuel then saw us head southeast towards Dodge City, where we stopped at a Bella Italia for lunch. It was pretty dark inside and didn't help with the feel of tiredness that we all shared. The lasagna was nice and a Dr Pepper helped to perk me up with a sugar boost. The stop also gave us time to check models and the SPC, which had indicated the outflow boundary we were going for had dropped further south. Heading south through Dodge City (after being held up by a very long freight train), I saw many of the sights that greeted us as we drove through Dodge on the day of the tornado outbreak just 2 years prior. Although optimistic, I didn't think there will be another day like that, well, not for a long time anyway! We continued south towards Minneola, where the Dodge City outbreak began and passed again through many of the locations we had stopped in. Sadly, the view today was relatively boring in comparison. A quick refuel and we continued on our way south, where a storm had just started on the boundary, currently at Englewood. Olly picked up the driving from here. As we continued south (and then accidentally taking a road east...where we had to turn back on ourselves) before blasting by Paul and the Netweather guests (tooting as we went by), where we could see the strong updraft building in front of us. It was slowly moving east, so we decided that we would turn east on the county roads before we hit Rosston, travelling close to the base as possible. We had to stay close as it soon started to precipitate and given our position, we didn't want our view of the area of interest to be occluded by the rain and hail. We zig-zagged south east on these roads. The rotation was certainly picking up and a hook was beginning to form. 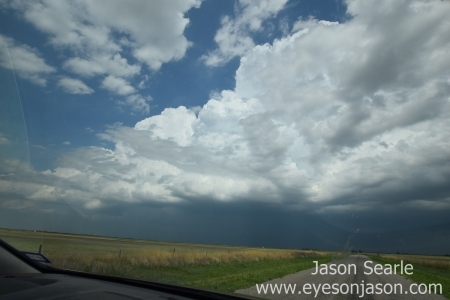 here were several blasts of rear flank downdraft winds. 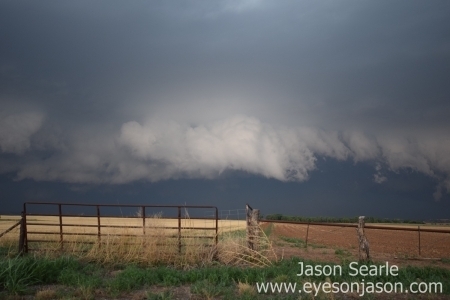 This was promising for tornadic development and we had the rime view of a persistent wall cloud and areas of rotation. There were times we thought it was going to drop. As we pulled away from one of our stops, the car made a very unusual noise - almost as if we had a flat. Thankfully we didn't and it was something caught on the mud flaps, but it was a bit worrying as we thought our chase would have been over. It was at this point that we had spotted on radar (and social media) that a storm had gone up at Dodge City, which went on to produce a spectacular stovepipe tornado. It looked near identical to the one that raced through the cornfields in front of us two years ago. It is always disappointing missing out on a tornado (as we really found out yesterday), but took some solace in the fact that about 99% of the other chasers on the road today also missed out on it. 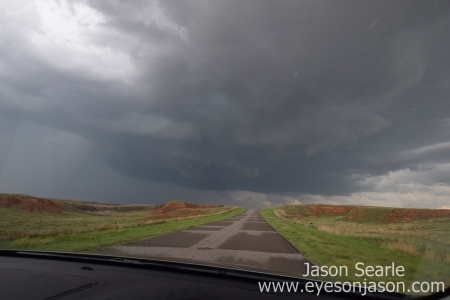 The whole thing ended up rotating in front of us and radar showed it was edging closer to us still. We hit the road and head south to join highway 64 and move east to stay out in front of it. Chaser convergence was extreme today. Loads of cars, TV network vans and chaser vehicles were out, as were the portable research radars, which made the roads extremely busy and dangerous. Thankfully it wasn't too bad to navigate and Olly did a fantastic job given the conditions. We continued east along highway 64 and across the Cimarron river (it seemed strange as we keep crossing on this road this trip - 4 times out of all the roads and points in the US...at least we are consistent about something). 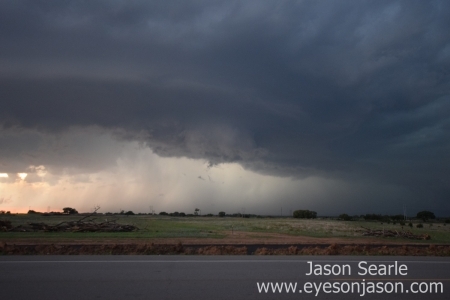 Watching, the hook soon became occluded by 3.50" hail, with a TVS (tornadic vortex signature) deep within. Ideally we still wanted a view inside so we had to keep to its south east to peer inside. Unfortunately the precipitation was too heavy and limited road options meant we were never going to be able to see inside. We stopped several times to take photos and to admire, before taking a right to drop down south through Waynoka. At this point, new areas of rotation were forming and a severe warning polygon appeared in our area. Additionally, some of the precipitation was heading our way, with the chance of some hail. We raced south from Waynoka, with large rain droplets hitting our car. Once a few miles south, we pulled up on a westward facing road for more photographs and video. The storm slowly (I mean really slowly) rolled towards us, with many different areas of rotation that could have dropped a tornado. There was a report of one tornado at this point, although some other chasers that we had spoken to had said that it was more of a funnel cloud than anything. Still, it was reported... The storm continued to roll closer towards us and we continued again south (trying hard not to be caught up in the chaser convergence). Once reaching highway 412, we took an east road. At this point we were considering hotel options. Enid looked the best place to go and we soon booked up America's Best Value Inn. The breakfast in these are not the best, but the rooms are comfortable and they are usually a pleasant stay. Continuing towards Enid, with the storm close to the northwest of our position, I looked out towards the north and started to see a new wall cloud start to form. We managed to pull over and observe the wall cloud try desperately to try and form a tornado, but despite trying very hard...it decided that it wasn't going to drop. 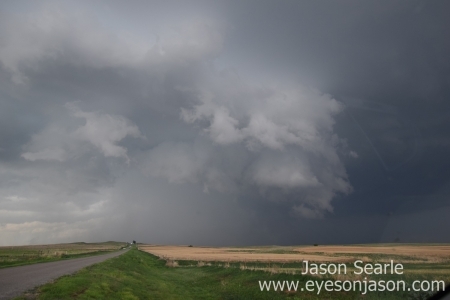 It was disappointing, but still a thrilling sight to see as the storm continued to head east with its 3.50" hail core. The rest of the drive was uneventful, with a short drive towards Enid, where we stopped for dinner at a Chili's restaurant, our first of the year. Fajitas on the menu and opting to be the designated driver to the hotel, we ate, caught up with Paul and his team (who had also chosen to eat here) before returning to our hotel. Despite no tornado, we counted this as a successful chase. The night was still not over, as a new storm followed the one we had chased, which had a nice amount of rotation on it and a bit of a hook. 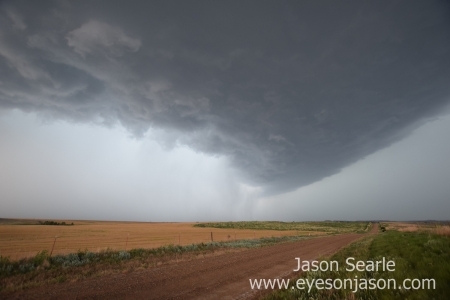 It was due to pass right over our hotel, so we got prepped with our cameras and phones and enjoyed watching as the heavy wind, rain, hail and frequent lightning gave us a fantastic way to end the chase. Tomorrow's chase had also just gone from a marginal to an enhanced, so we may even get one last spin of the chasing wheel before we need to pack up and head south back down to Austin. I have so many photos that I cannot wait to share, but I do want to go through them all and make sure I get the best out of them before I share them here I have included a few shots to give you an idea on what I have seen. If you can't wait, I have a few videos and photos on my facebook/instagram pages (@eyesonjason). Right, time for bed I think. Until my next post, stay safe!